Climate change has gradually emerged as a major challenge for developing countries like India where large scale climate variability exposes the country to enhanced climate risks. As the world gathered at Paris to negotiate a better climate deal for saving the world, record breaking rainfall wreaked havoc in Tamil Nadu, giving a visual warning of the ferocity that nature can unleash upon us. Cuddolore town, the headquarters of a district with the same name, was also not spared nature’s wrath. As Cuddalore reeled under drastic inundation, its economy took a severe hit. Small and informal businesses in particular were drastically affected. Factors like sparse savings, the lack of legal status, along with the small scale of their operations all exacerbate the impacts of disasters on such enterprises. Under such context, sustaining such enterprises in the local market becomes a challenge. Trying to foster faster local market recovery through innovative risk transfer approaches like disaster micro-insurance, this was a critical period for us to find out the real needs of such small and informal businesses and incorporate them in the long-term solutions. Since Cuddalore was one of our proposed research sites, these new developments had great implications for our study. 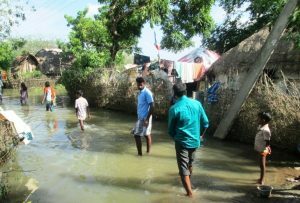 The demand survey held earlier in Cuddalore largely highlighted the loss and damage to be induced by cyclones, where floods were not among the highest threats. However, this unprecedented flooding has shattered all previous perceptions resulting in a drastic recalibration of the risks and threats to such small and informal businesses. A majority of small business owners have suffered huge losses due to the heavy flooding in Cuddolore. An assessment of the situation was conducted to understand the situation and to estimate the extent of impact upon the small businesses. The preliminary assessment suggests widespread loss and damage to all categories of small businesses. The submergence of entire neighbourhoods and localities has brought the daily livelihood activities of such businesses to a screeching halt. Most of the small business owners’ shelters were inundated and their belongings were washed away by the flood waters. Some of them have shifted to the relief camps. Others suffered heavy losses. Many of the temporarily structured/moveable businesses did not suffer any physical damage, but lost a number of livelihood days which can push them into a vicious cycle of debt. As per the rapid assessment report, the tragic impact of the floods on daily wagers, small businesses and the unorganised sector is harder to calculate. This is because of the great variation in the nature of business activity and mobility practiced by the various categories in this group. For instance, some small business owners sell their products by roaming from one place to another while others have set-up shop in permanent structures. This difference in set-up is also reflected in the losses suffered by them. Small businesses selling food and other perishables such as meat, fish, vegetables and fruits also suffered heavy losses as buyers could not venture out to purchase them. Most notably, the decreased supply of these essential items has pushed up their cost, thereby limiting affordability for many. Having faced this disaster, such businesses are left with no appropriate options for recovery as none of them have insured their businesses/shelters. Now, as they gradually come to grips with the tragedy that has befallen them, a lot of them are ending up borrowing money from money lenders with interest rates that may vary between 24% to 60%. The exploitation of helplessness small and informal businesses is alarming. The business owners who borrow money at such exorbitant interest rates run the risk of falling into a debt-trap. Moreover, the plight of small businesses would be neglected in the initial relief operations because livelihood recovery is deemed a long-term goal. Our innovation (disaster micro-insurance scheme for informal businesses) is precisely aimed to help small and informal businesses during such exigent times. Although the risk of flooding may not have figured highly in our initial demand survey, all the impacts that we now see had already been envisioned in the design of the product. The need for local market recovery still looms large. Our innovation aims to fulfill this need. This assessment has highlighted that the small business owners are carrying both a physical and psychological burden of loss coupled with worries for sustaining life once the flood recedes. There will be more to calculate and estimate once the water recedes from the shops and shelters.